Do not turn to mediums or necromancers; do not seek them out, and so make yourselves unclean by them: I am the LORD your God. (Leviticus 19:31). Do angels and demons really exist? The Bible says they do. Mentioned by name are two elect holy angels (the good guys): The Archangel Michael (Daniel 10:13) and Gabriel who carried messages (Daniel 8:16). Scripture also mentions the Angel of the Lord; the Captain of the Host of the Lord; messengers; and guardian angels. The Bible tells the story of fallen angels (the bad guys). Lucifer, one of God’s highest angels, led a revolt against God (Isaiah 14:12-14) and was banished from Heaven along with angels who took his side. Some scholars believe that as many as one third of the angels rebelled against God. Lucifer is known by many different names that have various meanings. For example: Satan (Mark 1:13); Devil (1 John 3:8); Abaddon (Proverbs 27:20); Evil One (John 17:15); Power of Darkness (Colossians 1:13, 14); Belial (2 Corinthians 6:15); Beelzebul (Matthew 10:25); Serpent of Old (Revelation 12:9); and Tempter (Matthew 4:3). Fallen angels are most commonly called demons. Demons are powerful spirits that can causes all sorts of afflictions. Read what these odious creatures can do to humans here. Demons can cause sickness (Mat. 12:22); insanity (Luke 8:26-36); bodily injury (Mark 9:14-26); long term infirmities (Luke 13:11-13). Holy angels are incapable of going against God, whereas unholy angels continuously go against God in their quest to lead people astray. Since they have no physical limitations they’re not bound by the laws of physics. They possess intellect (Mat. 8:29, 2 Cor. 11:3), emotions (James 2:19, Rev. 12:17), and will (Luke 8:28-31, 2 Tim. 2:26). Are All Angels Safe? By Marsha West – New! Extreme Teaching of Jennifer LeClaire–Churchwatch Central – New! Spiritual warfare is a reality believers have to be ready for: The greatest warfare for a Christian is not taking place out in the fallen world, but inside our own hearts, says Dr R Albert Mohler Jr. 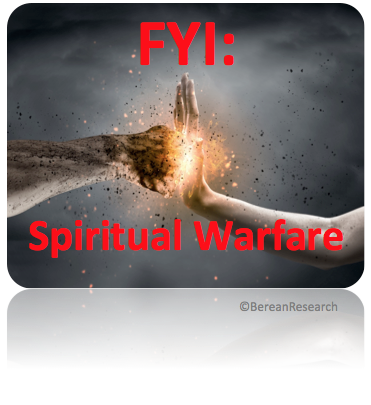 Spiritual Warfare: What Does the Bible Say? Visions, dreams and revelations: demon possession or genuine prophetic fits By Elizabeth Prata New!